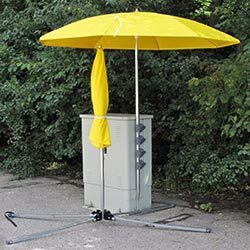 For over 30 years we have been manufacturing industrial pop-up work tents & umbrellas for people who need to get work done no matter the weather. Our tents set up in seconds with no loose parts and can be engineered to fit a customer’s specific application. Made from a lightweight, urethane coated material that is water repellant and flame resistant to CPAI-84 standards; Pop’N’Work tents provide a safe and comfortable work environment that will increase productivity and reduce weather related delays. Pop’N’Work tents are made to withstand regular use with a virtually unbreakable frame made from cold rolled steel and fiberglass. We stand behind the quality with a 2 year guaranty on the frame. 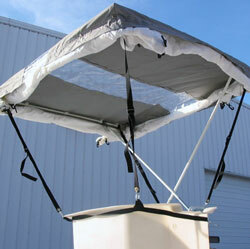 Lightweight and durable tents with no loose parts that can be setup by one person in 30 seconds. Exclusive POP’N’WORK unified frame made with cold rolled steel and fiberglass is virtually unbreakable. 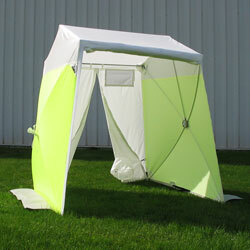 Beyond just adding a logo, Creative Tent Solutions can engineer a tent to your specific application. 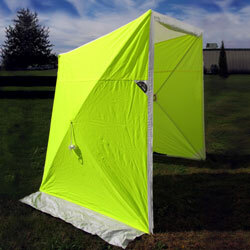 Specialized Products Company sells Pop’N’Work tents and umbrellas for our customer’s outdoor protection needs. Their products are excellent in quality and their company is always extremely helpful. Top quality craftsmanship and customer service support. The big factors of a continued business relationship covering 13 years – ‘No feeling tense when you’re under their tents’.